Auto dealers in Massachusetts need to undergo a multistep licensing process before starting their business in the state. 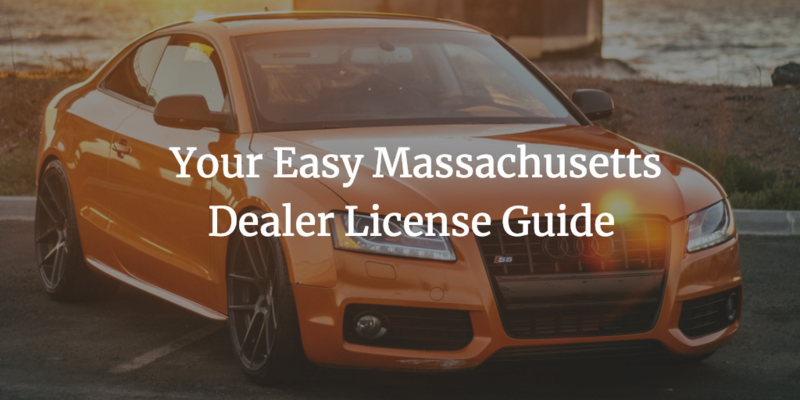 Obtaining your MA dealer license is obligatory for opening a dealership. Even though the requirement to get licensed is on a state level, the procedure for getting the license is regulated on a city level. Local authorities require from aspiring car sellers to meet a number of requirements, which will vary from place to place. If you want to open a used car dealership, you will have to obtain a Massachusetts auto dealer bond. Looking to launch your operations as a dealer? Learn here the essentials about the licensing and the criteria you have to fulfill to start your dealership. The Massachusetts Registry of Motor Vehicles (RMV) is the state body overseeing the activities of dealers. However, the licensing procedures are set and executed by city or town authorities. Thus, their exact requirements differ. For more details about the license classifications, you can refer to Section 58 of the Massachusetts General Laws. While the criteria that you have to meet vary depending on your local authorities, there is a list of common requirements applicable to all dealer applicants in Massachusetts. In addition, every municipality requires a different licensing fee. Its amount is below $200. These are the general criteria that dealers in Massachusetts have to comply with. In order to get the full picture of the licensing requirements that you have to meet, make sure to contact your local authorities. If you’re applying for a Class II license as a second hand dealer, you will have to obtain a surety bond. The required amount is $25,000. The purpose of the bonding is to protect an additional layer of protection for the state and your customers. It serves as a financial guarantee against potential illegal actions you may engage in as an auto dealer. If you transgress from your legal obligations, a harmed party can seek a compensation by making a claim against the bond. The bonding process entails that you cover a small percentage of the required bond amount. For applicants with stable finances, the typical rates are between 1% and 3%. This means that you can pay as little as $250 to $750 for a $25,000 dealer bond. The factors that matter in the bond cost formulation are your credit score and business financials. Additional indicators for financial strength can be any assets or liquidity that you showcase. Your surety examines your overall profile to assess the bonding risk. The lower it is, the smaller your bond price would be. Ready to start your licensing and bonding as a Massachusetts car dealer? We’re here to help. Reach us at 866.450.3412 to get assistance with your questions.